I was as excited as any grown up pop fan might be to hear recently of a Crowded House reunion, and the first album in fourteen years. Temple of Low Men and Woodface were prime candidates for CDs to wear out in many people's collections, certainly ours. The reunion came together over a Neil Finn record that got band-y, and everybody heard it. Nick Seymour, the original bassist, was on hand, and several studio drummers. The album started with Ethan Johns producing, and later Steve Lillywhite came in to do the last two tunes that turned into four. When Finn and Seymour realized where this session was going, they rang up Mark Hart, who'd been an integral part of the band on the last two records. They picked up L.A. drummer/producer Mark Sherrod, and the game was afoot. The tragic suicide of original drummer Paul Hester in 2005 is something people never get over, but the band has moved on to making more great music. The spirit of Hester runs through a number of songs that, although the spark of the band's zenith is ever present, are marked by an inevitable gravity that no one escapes. But the groove goes on, and the tunes ring true, and a world tour is underway. 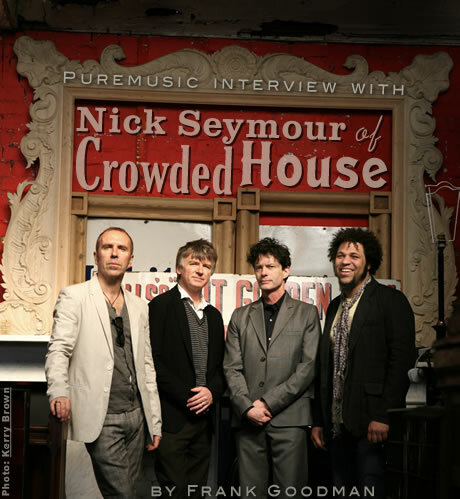 I was surprised to hear that I would not be speaking with Neil Finn, but with the cheeky original bassist Nick Seymour, who was very accommodating in every way. He is also the outrageous painter whose work appears on CH covers, and a producer in his own right. When you catch the band on their global attack, his work may be in the lobby or onstage, so watch for that. Time On Earth is cause for celebration, and there's not a moment to be wasted. 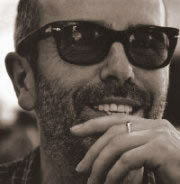 Ladies and germs, Nick Seymour of Crowded House.